Constructive Steps for States to Use to Correct the Fiscal Irresponsibility of Congress | No Convention of States! LOWER THE DEBT CEILING — Congress is mismanaging what we gave them — increase restrictions on any further credit to Congress. 4 of 10 dollars in the budget are borrowed; interest is owed on the 40% of borrowed money spent unconstitutionally. Your budget won’t last doing that and neither will the budget of our nation. REFUSE TO PLAY BALL ON the liberals’ terms — the fiscal responsibility movement has all the power now—we pay the bills. Cuts with punishment are what we live under; Congress shall do the same and the President only pretends he won’t negotiate. SHUT DOWN ALL NON-ESSENTIAL FEDERAL SERVICES (there are a countless number of them)–beat the liberals at their own game since the administration already admitted it was only shutting down “non-essential services” anyway! STOP PORK BARREL SPENDING by burying special projects within spending bills. Recall or fire officials who persist. ENACT A FISCALLY RESPONSIBLE BUDGET MUCH TIGHTER THAN RYAN’S BUDGET — we want relief NOW, not in twenty or more years–who is kidding whom? 20 years is too late to wait. In 2010, for the first time in modern budget history, the House failed to pass a budget as required by the 1974 Budget Act. Without a budget in place, it is impossible for Congress to make sound judgments about spending bills. ENFORCE The 10th Amendment. OVERHAUL THE BUDGET PROCESS — we cannot be serious about fixing out budgetary problems if we do not look at the manner in which we establish budgets for the federal government. Right now, Congress establishes the budget based on one year time periods. However, switching to a process of biennial budgeting would require two year budgets and allow for more time and greater deliberation over the respective merits of government programs. Proposed future budgets must be adjusted for reality. TIE SPENDING TO SPECIFIC METRICS AND CAPS — recently we have seen an unprecedented growth in government spending and hiring in spite of a slowing economy. I believe we must tie federal spending to GDP growth in order to ensure that government spending does not outpace growth in our economy. Reduction in taxes shall be used to promote revenue. HOLD THE LINE ON SPENDING — since the economic crisis of 2008 we have seen unprecedented growth in government intervention into the private sector. Policies like TARP, the Recovery Act, and Cash for Clunkers resulted in massive new obligations with no benefit to taxpayers. We can save $100 billion right now by reducing spending to pre-bailout, pre-stimulus levels; drastically reducing foreign aid; stopping all military police actions under whatever rationalization they are being deployed; secure the nation’s borders and eliminate aid to illegal immigrants. COURAGEOUS STATE NULLIFICATION of all bogus mandates by Congress and that are not authorized by the Constitution and constitutional amendments. IMPEACHMENT OF ACTIVIST JUDGES AND POLITICIANS who violate their oath of office. Term limits are not the solution; we already have them and they are not effective in solving this kind of problem. REPEAL THE 17TH AMENDMENT so our states will again have their power and veto in national affairs, by again appointing our senators; hold the state legislatures to fiscal responsibility at home as well. REFUSE “STIMULUS MONEY” States and cities must use fiscal restraint from any governmental source, and return their governments to only basic, legitimate programs. Arizona takes more federal money than any other state, it pays hundreds of millions in interest payments on loans yet claims to have its fiscal house in order! Arizona takes care of Arizona, not the federal government. 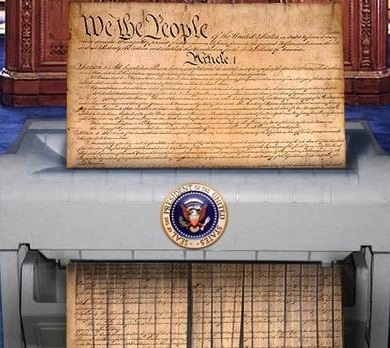 END GOVERNMENT CONTROL OF FANNIE MAE, FREDDIE MAC AND OTHER UNCONSTITUTIONAL FEDERAL PROGRAMS — federal intervention in the private sector in 2008 resulted in the government takeover of the mortgage giants Fannie Mae and Freddie Mac. These institutions continue to lose money, spending while leaving taxpayers on the hook for these losses. The only way to address this problem is to end government control of Fannie and Freddie and stop the unconstitutional programs of Federal Departments. ENACT CONSTITUTIONAL LEGAL TENDER LAWS since states are mandated to use specie legal tender in U.S. Constitution Art. 1, Sec. 8, 10 to prevent paper currency “Bills of Credit”; REPEAL the Federal Reserve Act of 1913; ENACT “Competition in Currency” Acts under federal law to let the marketplace determine honest, successful financial practices. LEARN CONSTITUTIONALISM and teach your children the constitution and their relationship with “The Laws of Nature and Nature’s God”.